Slightly smaller than our own moon, nearly 370 million miles away during its closest approach to Earth, Jupiter’s moon Europa is wrapped in a perpetual frozen landscape of silicate rock and ice. Despite its desolation, these features suggest that Jupiter’s fourth largest may contain an ocean of liquid water beneath its glacial surface covering. Where there is water, there may be life… And with the search for life beyond our own planet having become the driving inspiration for most modern space exploration, the producers of the science fiction film EUROPA REPORT have envisioned a story that was heavy on science and rooted in plausibility. 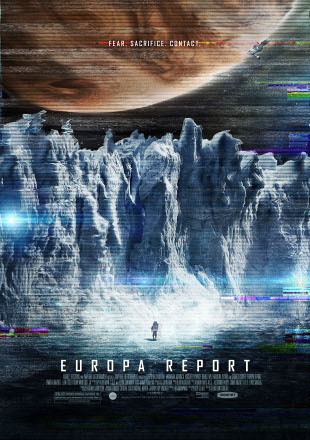 EUROPA REPORT tells of a privately funded mission to search for life on the Jovian moon told through the digital audiovisual records transmitted to Earth from the spaceship Europa-1, along with news conference and promotional videos made by Europa Ventures, the company funding the mission. It’s clear from the start that the mission has not gone well; despite a disastrous communications failure leaving the Europa-1 without contact back to Mission Control and no way to tell if any record of their discoveries will ever make it back to Earth, and so the crew continues with its mission to find life on the remote moon, eventually realizing that momentous discoveries sometimes come with great sacrifice. The film possesses a remarkable international cast, replicating the mix of nationalities that would likely fall into such a privatized group of astronauts. American-born Hong Kong actor Daniel Wu (MAN WITH THE IRON FIST, TAI-CHI HERO) and Romanian Anamaria Marinca (acclaimed for her performance in 4 MONTHS, 3 WEEKS AND 2 DAYS) played pilot and co-pilot of the Europa-1 and the officers in charge of the mission; Sweden’s Michael Nyqvist (the original GIRL WITH THE DRAGON TATTOO, MISSION: IMPOSSIBLE GHOST PROTOCOL) and South Africa’s Sharlto Copley (DISTRICT 9) as Europa-1’s engineering staff; American actor Christian Camargo (supporting star on TV’s DEXTER and in TWILIGHT: BREAKING DAWN) and Polish-American actress/model Karolina Wydra (CRAZY STUPID LOVE, guest star on HOUSE) played the mission’s scientists, responsible for discovering and validating what might be found on the moon. Back on Earth, Embeth Davidtz (Mary Parker in THE AMAZING SPIDER-MAN, supporting star on the US remake of GIRL WITH THE DRAGON TATTOO) plays Europa Ventura’s PR spokesperson. Portions of the following interviews were quoted or paraphrased in my notes for the EUROPA REPORT soundtrack album, released by Sparks & Shadows. With permission from the label, I am presenting my complete Q&A interviews with director Sebastián Cordero and composer Bear McCreary for this extended examination of the making of the film and its musical score.